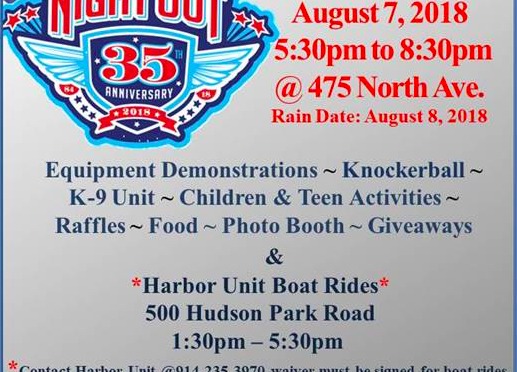 Come celebrate the “National Night Out” with games, kids’ activities, food, demonstrations, and more tomorrow (Tuesday) evening from 5:30pm to 8:30pm at New Rochelle Police Headquarters, 475 North Avenue. Earlier in the afternoon, you can arrange a boat ride with the NRPD’s Harbor Unit. 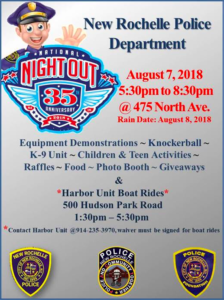 The “National Night Out” helps build strong relationships between Police Departments and the communities they serve, and I am proud that our own local PD does such a great job. There’s more in this flyer.